This is Witchiepoo, a paper-maché project that my siblings (Shannon and Steven) and I made when we were kids in the mid 1970's for a Halloween decoration, under the direction our very creative and artistic mother Peggy. We built her in several stages using a large mixing bowl turned upside down to make each half of her head. The bowl was then covered with strips of newspaper that we dipped into the paper-maché paste. We did this twice over several weeks, allowing each half to dry completely, and then the halves were attached together with more paper-maché. Finally, the face and hat were added. It was a fun process because we got to get our hands messy in the paper-maché paste. Once it was all dry we all shared the job of painting Witchiepoo. It was a team project from start to finish. My mother Peggy always encouraged my siblings and I to enjoy doing art. Whether it was painting, cutting shapes out of construction paper and gluing them onto something, getting our hands messy doing paper-maché, making cut out figures from an egg carton, or drawing and colouring our own pictures, my mother always kept us busy and having fun with art projects. This is when I learned to appreciate creativity and making art, and have continued doing so ever since. 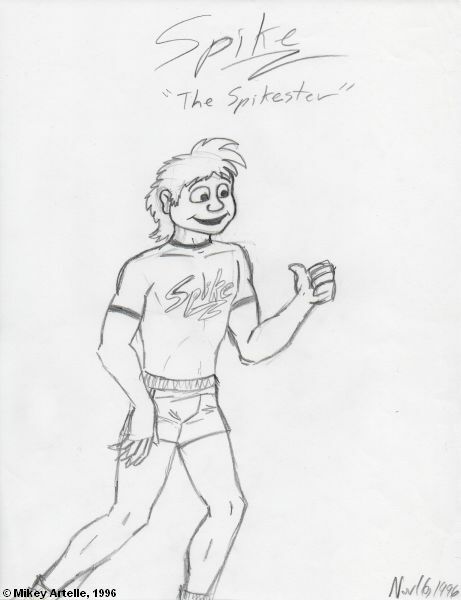 When I was 13 or 14 I made up my own cartoon character named Spike, also known as the Spikester. The above drawing is from the late 1980's and was made as a doodle on the cover of my textbook which had been wrapped in brown paper. From grade seven to grade nine (1987 to 1989) I drew Spike as often as I could. He was somewhat of an alter ego for me. Spike was an adventurer and did everything. 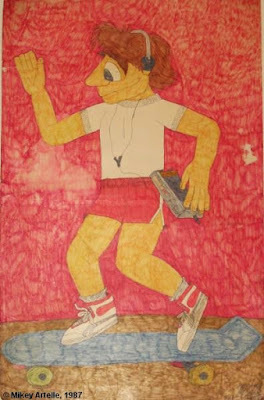 I have drawings of him fighting a dragon, falling off a cliff, parachuting, surfing, skateboarding, and on and on. In fact my classmates used to tease me about drawing Spike so often, though they always enjoyed seeing what he was up to next. In grade seven my homeroom teacher decorated the classroom with several of my Spike pictures, where they remained for the school year. 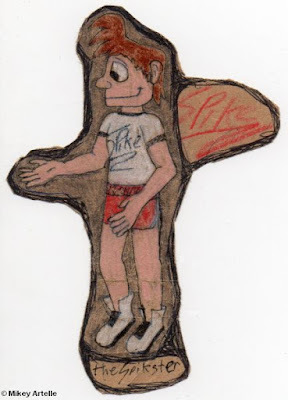 The above picture of Spike on a skateboard is one of the earlier drawings, dated Feb 4, 1987. This large sized drawing was done on a 14 X 22 piece of Bristol board and coloured with marker. At one point this picture had something spilled on it, and there's a tape tear on the right near his elbow, so it's in quite rough shape. I'm lucky to still have it at all. Spike looked a little different at the start with a bigger, pointed nose and large eyebrows. His shoes are quite different in this picture too, and his shirt doesn't have the Spike signature logo on it. This is a painting of Spike from 1987. It was done on a large piece of construction paper, 23.5 inches wide by 17.5 inches high. I have no idea why I chose to paint this particular scene. Perhaps Spike needed a break from his adventures? 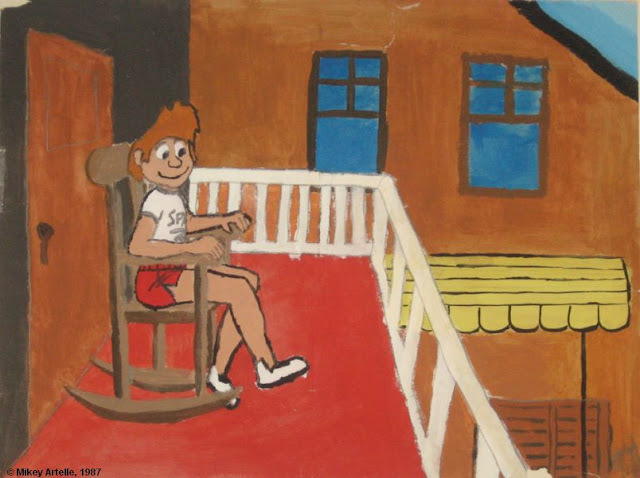 He certainly looks happy sitting in his rocking chair directly in front of a door while up on a balcony. I wonder what would happen to Spike if someone opened that door? He might need some wings! I like the bright colours in this picture and find the figure of Spike is one of my best images of the character from that time. 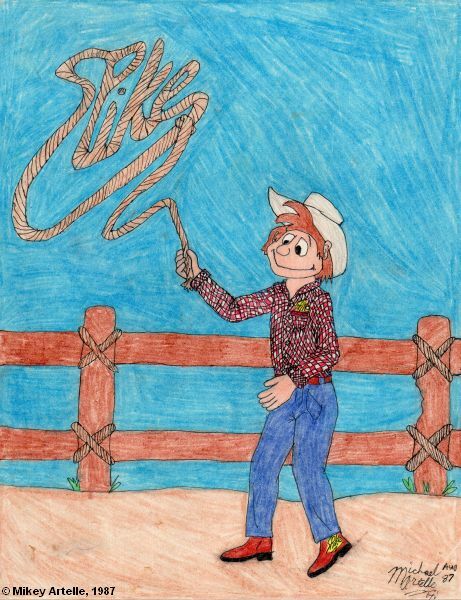 This drawing of Spike dressed as a cowboy is from August 1987. It's coloured with pencil crayon. This is a fabric illustration of Spike dated October 11, 1987 on the back. It was made on a 12 inch wide by 16.5 inch high piece of corrugated cardboard that I covered with white fur fabric. 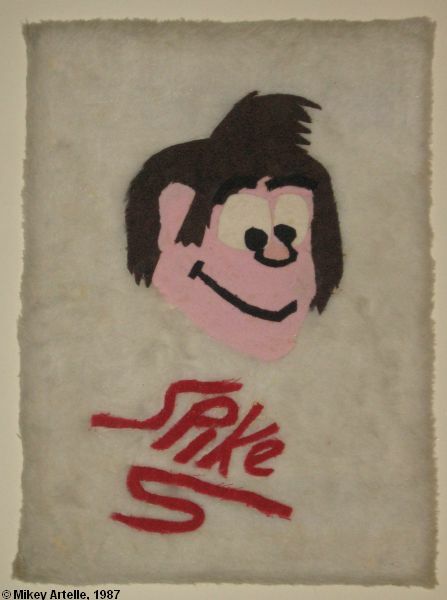 Spike's face is made out of several pieces of fabric and glued down onto the background, as are the letters. Why I needed to make a fabric picture of Spike's face on white fur fabric, I haven't a clue? I think it was just the idea of making my own fabric puzzle out of Spike's face that interested me, as I really enjoyed doing puzzles when I was a kid. In any case I've always liked this piece just because it's so weird. 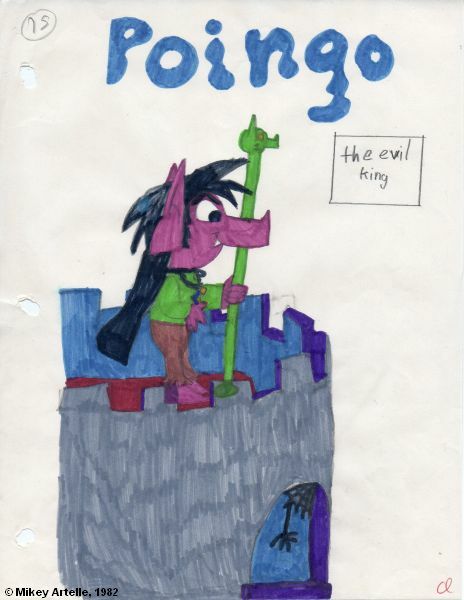 Here's another of my cartoon characters, Poingo Pig! He's one of the first cartoon characters that I created and used to draw for my own amusement. 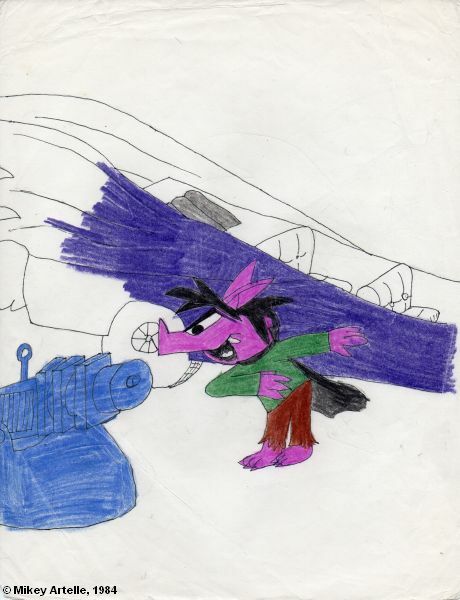 This drawing is likely from 1982 when I was eight years old, as the character was created in the early 1980's several years before Spike came along. Unfortunately I have few drawings left of Poingo though I used to draw him often, just as I did with Spike. I even made a paper-maché model of Poingo's head at one point. 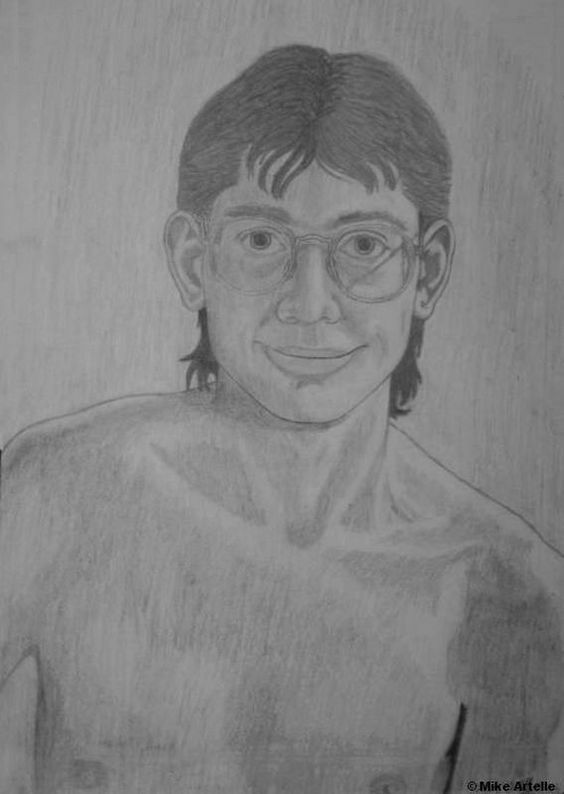 Here's another drawing of Poingo from the mid 1980s, likely 1984. Poingo was a comical villain with a lot of ambition but he never did anything right. He drove around in a purple stretch limo that had dragon wings on the back, which is seen in the above drawing. Poingo was always defeated by his heroic nemesis, Captain Roger Ray Beam, and also caused problems for Spike. 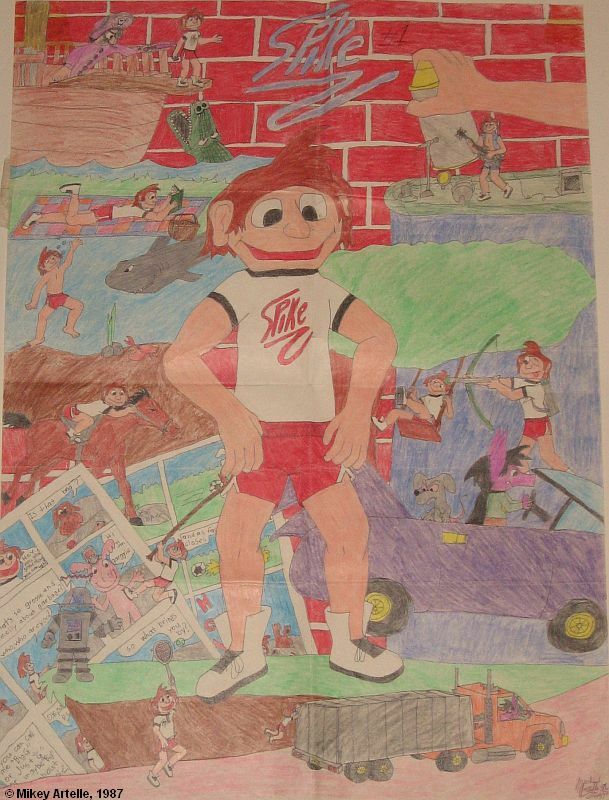 The character is also seen on a large poster sized drawing featuring Spike (shown below). This poster illustration from 1987 is 20 inches wide by 28 inches tall. It shows Spike during many of his thrilling adventures. Poingo Pig makes two appearances in this poster. On the right he's seen driving his purple limo accompanied by his side kick, a small rat character who's name I've forgotten. He's also driving the big rig truck with Spike hanging precariously onto the back. The comic book pages shown on the left side were from an actual comic book that I made about Spike, which unfortunately I no longer have. 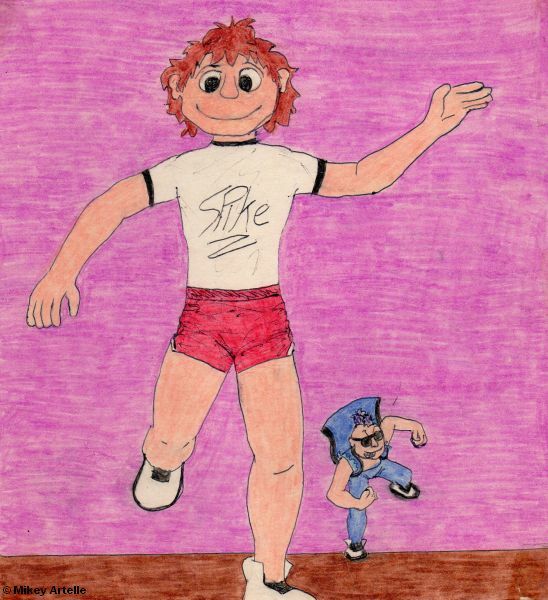 This 1988 drawing shows Spike running away from his nemesis Cockroach, who had a purple Mohawk. This is Spike's usual outfit, a pair of red shorts, a white T-shirt with black trim on the neck and sleeves, and a pair of white high-top sneakers. He's definitely a product of the 1980's! I had designed a very distinct logo for spike's T-shirt, which is the same one he's making with his lasso in the above cowboy picture. In 2003 the TV station TNN changed their branding and called themselves Spike TV. I found their logo was all too familiar! Here are two examples of the Spike TV logo. As you can see it uses an oversized, dramatically looping "S" and an upwards tilted "E", and the word is presented as a black signature style font on a white background. Hmmmm? Where have I seen that before? In any case, it's fitting to point out that today Spike TV has an entirely different logo, which allegedly was designed in the early 1970s by a ten year old from Australia. :) Okay, I made up that last part. The kid was from Holland...and he was nine... allegedly! Hmm, I wonder how much it costs to rebrand an entire TV network? That can't be cheap! This sketch of Spike was done on my birthday, Nov 16, 1996, when I turned 23. I hadn't drawn a picture of Spike since High School. My artwork had improved while I was studying Animation in college, so I thought it would be amusing to revisit the character again. 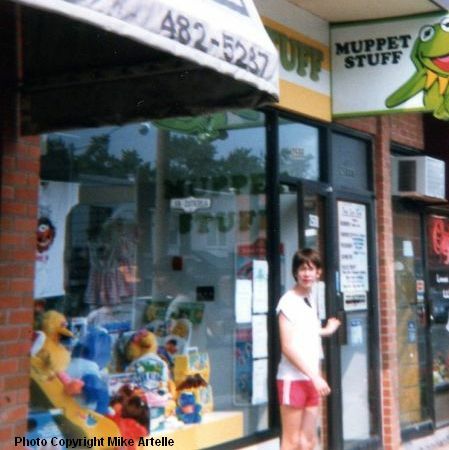 Of course, being a such a huge fan of the Muppets meant that I liked to draw pictures of them, which I did quite often. Below are just a few examples. 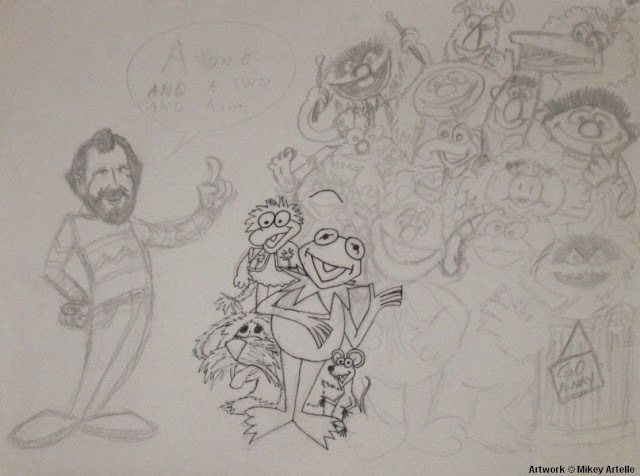 An unfinished drawing that I made of Jim Henson and the Muppets, circa 1989. This is one of my favourite drawings of Animal, made in 1991. It's drawn free hand from a photograph (no tracing). 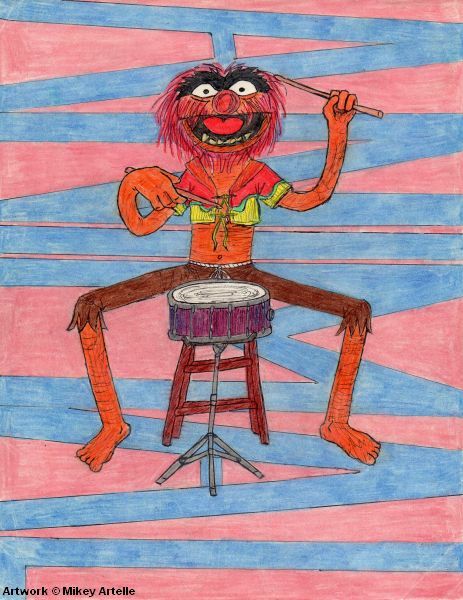 I added the legs and drum, and the background with Animal's name turned sideways. Rob the Slob and other "retired" puppets! This is Mr. Noodlehead! 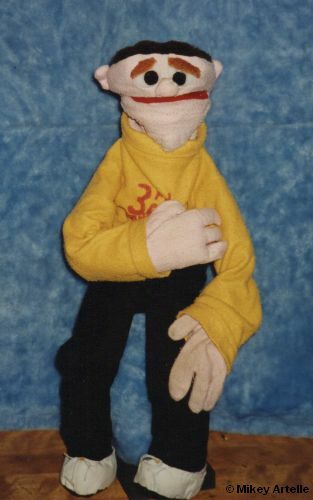 I built this puppet in the late 1980's. Mr. Noodlehead is a balding nerd with a big nose and two buck teeth, who likes bowties. He's the original geek before geek was cool. My Aunt Nancy made his awesome crochet sneakers! I once performed with Mr. Noodlehead at the Ottawa Super Ex during a youth talent show. He later joined my character Bruno the Dog when I performed on television for CJOH TV's Homegrown Café. Coincidentally in the late 1990's, a decade after I had created Mr. Noodlehead, the Sesame Street TV show introduced a character called Mr. Noodle. The character was portrayed by an actor rather than a Muppet. 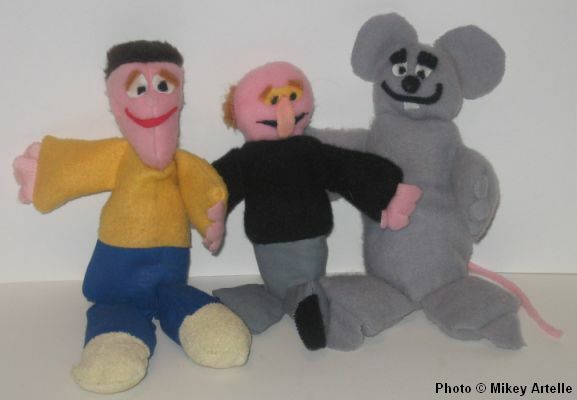 Here are some stuffed toys of my puppet characters that I made in the 1980s. Shown here are Rob the Slob, Mr. Noodlehead and Mousie Mousie. These are 8 to 9 inches tall. 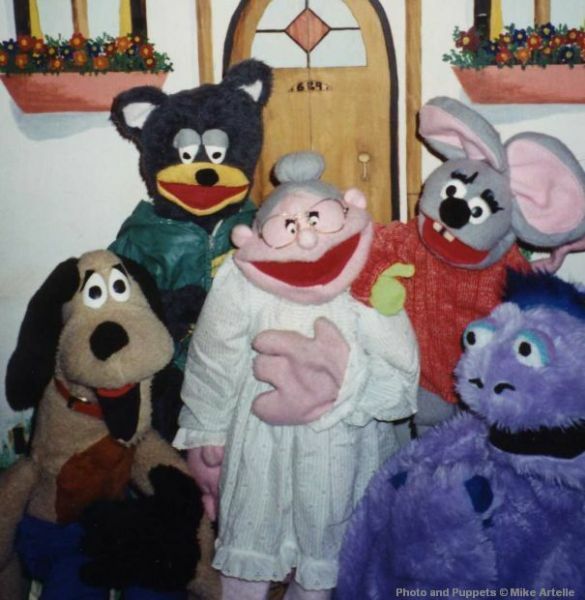 Above is group photo of some of my puppet characters from the late 1980s and early 1990s. Shown are, L to R, Bruno the Dog, Tyler the Bear, Nanny, Mousie Mousie and Gordon the Sea Monster. Because they are made out of fabric they simply wear out over time. Out of all of these puppets only Gordon is still holding up, yet even he is starting to look his age. 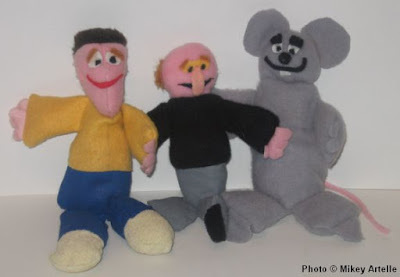 The puppet in the middle is Nanny who was used often in my puppet shows. Years ago I made the decision to discard the puppet considering the condition it was in. To this day I have a guilty conscience about that, as does my mother Peggy who performed her. We laugh about it every so often! Poor Nanny is at the city dump! RIP Nanny! Puppets simply wear out, it's one of those unfortunate things that can't be avoided. Fabric and sponge are not meant to last very long, 15 years at best. Sad but true. 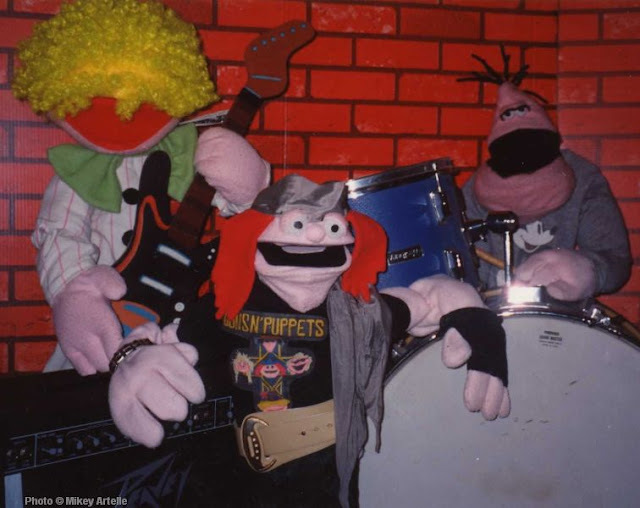 Being as sentimental as I am about my puppets, I miss them all. Puppets have a way of becoming a part of your family, especially if their characters are developed and familiar to you. Years ago I recall reading about a native tribe that didn't put faces on children's dolls as they believed doing so would give the doll a soul. There is certainly some truth to that logic! 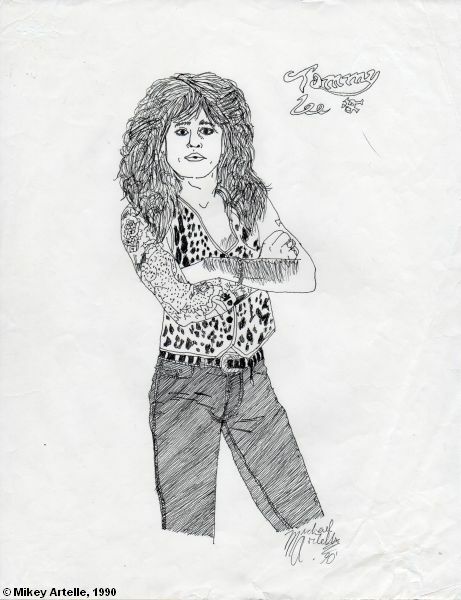 In 1990 I created a series of drawings in black pen based on my favourite rock stars of the day. Each illustration was made from a picture that I found in one of the many Heavy Metal magazines that were popular at the time. This was done free hand, no tracing. I still have a small stash of those magazines for nostalgia sake. 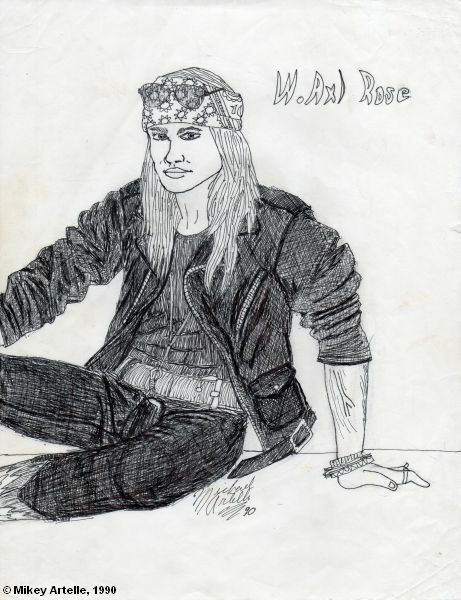 Of course the first drawing I did was Axl Rose. Though I'm not very good at it, I like playing the drums and had a set at one point. These next two drawings are of the drummers from bands that I liked. 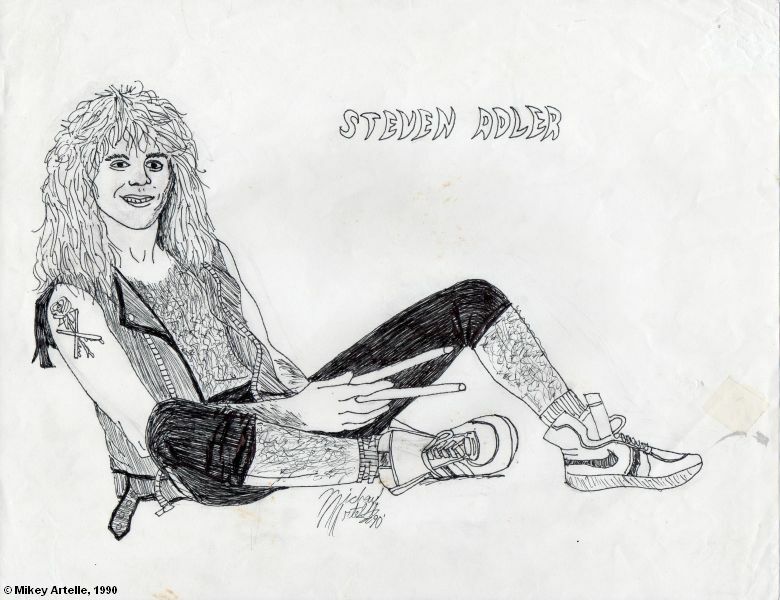 Above is Steven Adler from Guns N Roses, and below is Tommy Lee from Motley Crue. 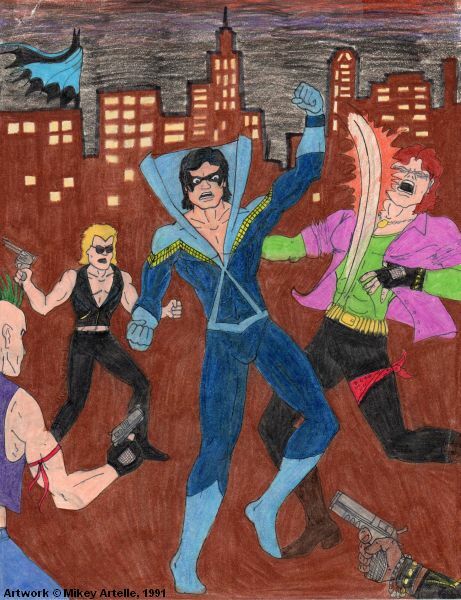 This drawing is my version of the DC Comics superhero Nightwing, and was made in 1991. Here is a collage that I made featuring the DC Comics superhero Hawkman. It's undated but is likely from 1991. 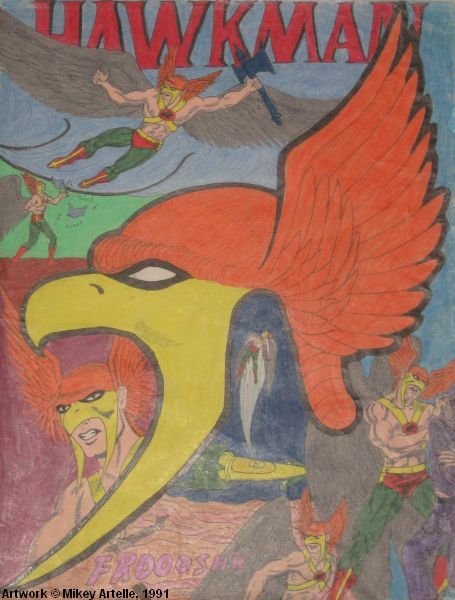 The different Hawkman images are taken from panels of the comic books, hand drawn (not traced), and I designed the layout myself. Hawkman has always been one of my favourite superheroes but unfortunately he has often been lumped in with DC's supporting background characters. I'm glad to see that he's being featured more often these days as a main character. To heck with Batman, bring on the Hawkman! 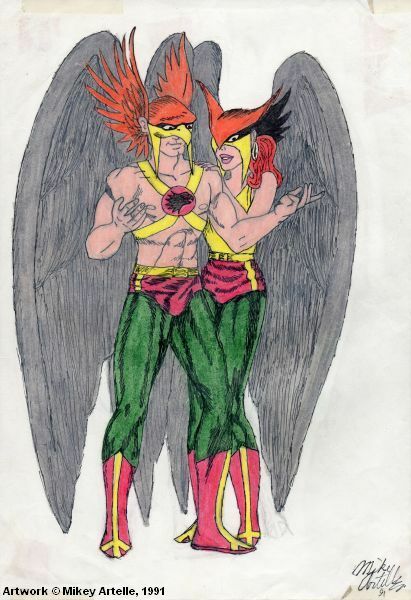 Another drawing of DC Comics' Hawkman, this time with Hawkwoman, made in 1991. I drew this from a comic book by hand (not traced) and added the legs. The above drawing was made in February 1995 when I was 21 and is the only time that I ever attempted to do a realistic self portrait. At the time, I was studying Animation at college and this was a homework assignment for the life drawing class. It took many hours to create and is a little wonky in some places, such as parts of the mouth and nose, but I'm happy with it. I was quite slim back then. Not sure why I took my shirt off for this drawing, it just seemed appropriate at the time. Being a shy person this was a bit out of character for me, as I did so despite knowing that I'd have to bring the drawing to class the next day where all my classmates would see it. That turned out not to be as embarrassing as I thought it would be. Actually, I'm quite proud of this one. Now that I'm much older, I'm glad to have it as a memento of my 20's. 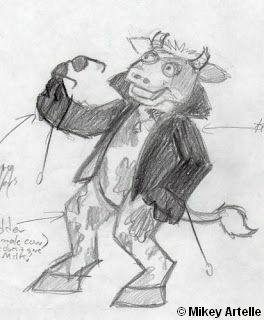 This is the very first drawing that I made of Hornz the Cow dated Nov 2, 1996. Notes on this sketch clarify that because Hornz is a male cow he doesn't have an udder, only female cows have udders and give milk. That's good news. It would be utterly strange if Hornz had an udder! 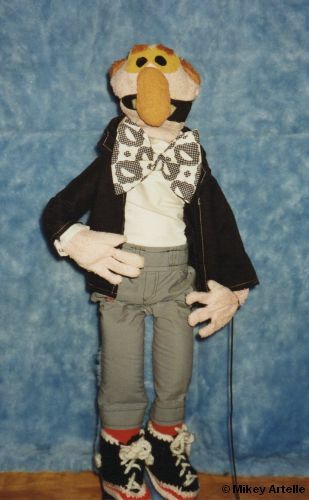 The puppet version of Hornz has normal human legs (jeans with biker boots), rather than cow legs as shown above. Though I'm a shy and quiet person, my artist's ego is alive and well! 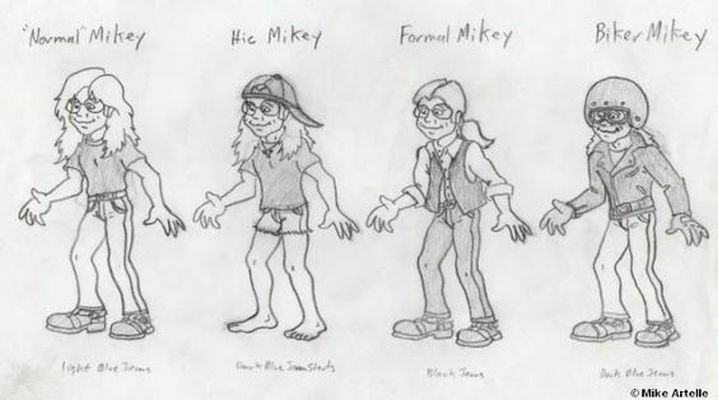 The above character designs show different outfits for a cartoon version of myself, which I drew just to be silly. I think this picture is a lot of fun. Note that I put the word "normal" in quotes! :) This was drawn in the late 1990's when I owned a motorcycle. My plan was to use this character for an original story called "Biker Dudes and Dragon Riders" which has yet to be completed. I have a lot of stories in my head that I'd like to get finished some day, and this is one of them. This story involves several dragons and would make an awesome picture book. I need to get busy!!! Hope you enjoyed reading about all of these different past projects!